"Genesis 1" redirects here. For other uses, see Genesis 1 (disambiguation). Borrowing themes from Mesopotamian mythology, but adapting them to the Israelite people's belief in one God, the first major comprehensive draft of the Pentateuch (the series of five books which begins with Genesis and ends with Deuteronomy) was composed in the late 7th or the 6th century BCE (the Jahwist source) and was later expanded by other authors (the Priestly source) into a work very like the one we have today. 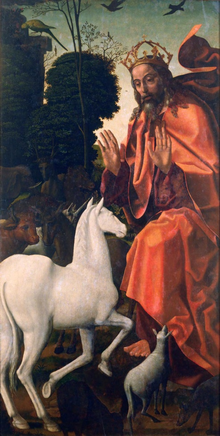 The two sources can be identified in the creation narrative: Priestly and Jahwistic. The combined narrative is a critique of the Mesopotamian theology of creation: Genesis affirms monotheism and denies polytheism. Robert Alter described the combined narrative as "compelling in its archetypal character, its adaptation of myth to monotheistic ends". Although tradition attributes Genesis to Moses, biblical scholars hold that it, together with the following four books (making up what Jews call the Torah and biblical scholars call the Pentateuch), is "a composite work, the product of many hands and periods." A common hypothesis among biblical scholars today is that the first major comprehensive draft of the Pentateuch was composed in the late 7th or the 6th century BCE (the Jahwist source), and that this was later expanded by the addition of various narratives and laws (the Priestly source) into a work very like the one existing today. As for the historical background which led to the creation of the narrative itself, a theory which has gained considerable interest, although still controversial, is "Persian imperial authorisation". 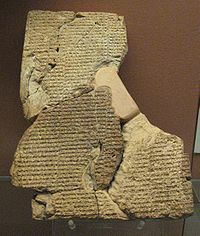 This proposes that the Persians, after their conquest of Babylon in 538 BCE, agreed to grant Jerusalem a large measure of local autonomy within the empire, but required the local authorities to produce a single law code accepted by the entire community. It further proposes that there were two powerful groups in the community – the priestly families who controlled the Temple, and the landowning families who made up the "elders" – and that these two groups were in conflict over many issues, and that each had its own "history of origins", but the Persian promise of greatly increased local autonomy for all provided a powerful incentive to cooperate in producing a single text. Consistency was evidently not seen as essential to storytelling in ancient Near Eastern literature. The overlapping stories of Genesis 1 and 2 are contradictory but also complementary, with the first (the Priestly story) concerned with the creation of the entire cosmos while the second (the Yahwist story) focuses on man as moral agent and cultivator of his environment. The highly regimented seven-day narrative of Genesis 1 features an omnipotent God who creates a god-like humanity, while the one-day creation of Genesis 2 uses a simple linear narrative, a God who can fail as well as succeed, and a humanity which is not god-like but is punished for acts which would lead to their becoming god-like. Even the order and method of creation differs. "Together, this combination of parallel character and contrasting profile point to the different origin of materials in Genesis 1 and Genesis 2, however elegantly they have now been combined." The primary accounts in each chapter are joined by a literary bridge at Genesis 2:4|, "These are the generations of the heavens and of the earth when they were created." This echoes the first line of Genesis 1, "In the beginning God created the heaven and the earth", and is reversed in the next phrase, "...in the day that the LORD God made the earth and the heavens". This verse is one of ten "generations" (Hebrew: תולדות‎ toledot) phrases used throughout Genesis, which provide a literary structure to the book. They normally function as headings to what comes after, but the position of this, the first of the series, has been the subject of much debate. Comparative mythology provides historical and cross-cultural perspectives for Jewish mythology. Both sources behind the Genesis creation narrative borrowed themes from Mesopotamian mythology, but adapted them to their belief in one God, establishing a monotheistic creation in opposition to the polytheistic creation myth of ancient Israel's neighbors. Genesis 1–11 as a whole is imbued with Mesopotamian myths. 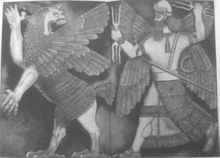 Genesis 1 bears both striking differences from and striking similarities to Babylon's national creation myth, the Enuma Elish. On the side of similarities, both begin from a stage of chaotic waters before anything is created, in both a fixed dome-shaped "firmament" divides these waters from the habitable Earth, and both conclude with the creation of a human called "man" and the building of a temple for the god (in Genesis 1, this temple is the entire cosmos). On the side of contrasts, Genesis 1 is monotheistic, it makes no attempt to account for the origins of God, and there is no trace of the resistance to the reduction of chaos to order (Gk. theomachy, lit. "God-fighting"), all of which mark the Mesopotamian creation accounts. Still, Genesis 1 bears similarities to the Baal Cycle of Israel's neighbor, Ugarit. The Enuma Elish has also left traces on Genesis 2. Both begin with a series of statements of what did not exist at the moment when creation began; the Enuma Elish has a spring (in the sea) as the point where creation begins, paralleling the spring (on the land – Genesis 2 is notable for being a "dry" creation story) in Genesis 2:6 that "watered the whole face of the ground"; in both myths, Yahweh/the gods first create a man to serve him/them, then animals and vegetation. At the same time, and as with Genesis 1, the Jewish version has drastically changed its Babylonian model: Eve, for example, seems to fill the role of a mother goddess when, in Genesis 4:1, she says that she has "created a man with Yahweh", but she is not a divine being like her Babylonian counterpart. Genesis 2 has close parallels with a second Mesopotamian myth, the Atra-Hasis epic – parallels that in fact extend throughout Genesis 2–11, from the Creation to the Flood and its aftermath. The two share numerous plot-details (e.g. the divine garden and the role of the first man in the garden, the creation of the man from a mixture of earth and divine substance, the chance of immortality, etc. ), and have a similar overall theme: the gradual clarification of man's relationship with God(s) and animals. The narratives in Genesis 1 and 2 were not the only creation myths in ancient Israel, and the complete biblical evidence suggests two contrasting models. The first is the "logos" (meaning speech) model, where a supreme God "speaks" dormant matter into existence. The second is the "agon" (meaning struggle or combat) model, in which it is God's victory in battle over the monsters of the sea that mark his sovereignty and might. Genesis 1 is an example of creation by speech, while Psalm 74 and Isaiah 51 are examples of the "agon" mythology, recalling a Canaanite myth in which God creates the world by vanquishing the water deities: "Awake, awake! ... It was you that hacked Rahab in pieces, that pierced the Dragon! It was you that dried up the Sea, the waters of the great Deep, that made the abysses of the Sea a road that the redeemed might walk..."
The cosmos created in Genesis 1 bears a striking resemblance to the Tabernacle in Exodus 35–40, which was the prototype of the Temple in Jerusalem and the focus of priestly worship of Yahweh; for this reason, and because other Middle Eastern creation stories also climax with the construction of a temple/house for the creator-god, Genesis 1 can be interpreted as a description of the construction of the cosmos as God's house, for which the Temple in Jerusalem served as the earthly representative. The word bara is translated as "created" in English, but the concept it embodied was not the same as the modern term: in the world of the ancient Near East, the gods demonstrated their power over the world not by creating matter but by fixing destinies, so that the essence of the bara which God performs in Genesis concerns bringing "heaven and earth" (a set phrase meaning "everything") into existence by organising and assigning roles and functions. The use of numbers in ancient texts was often numerological rather than factual – that is, the numbers were used because they held some symbolic value to the author. However, among commentators, symbolic interpretation of the numbers may coexist with factual interpretations. The number seven, denoting divine completion, permeates Genesis 1: verse 1:1 consists of seven words, verse 1:2 of fourteen, and 2:1–3 has 35 words (5x7); Elohim is mentioned 35 times, "heaven/firmament" and "earth" 21 times each, and the phrases "and it was so" and "God saw that it was good" occur 7 times each. Numerically significant patterns of repeated words and phrases are termed "metered repetition." They begin in the creation narrative and continue through the book of Genesis. essentially similar to the second version but taking all of Genesis 1:2 as background information ("When in the beginning God created the heavens and the earth — the earth being untamed and shapeless... — God said, Let there be light!"). The second seems to be the meaning intended by the original Priestly author: the verb bara is used only of God (people do not engage in bara), and it concerns the assignment of roles, as in the creation of the first people as "male and female" (i.e., it allocates them sexes): in other words, the power of God is being shown not by the creation of matter but by the fixing of destinies. The heavens and the earth is a set phrase meaning "everything", i.e., the cosmos. This was made up of three levels, the habitable earth in the middle, the heavens above, and an underworld below, all surrounded by a watery "ocean" of chaos as the Babylonian Tiamat. The Earth itself was a flat disc, surrounded by mountains or sea. Above it was the firmament, a transparent but solid dome resting on the mountains, allowing men to see the blue of the waters above, with "windows" to allow the rain to enter, and containing the Sun, Moon and stars. The waters extended below the Earth, which rested on pillars sunk in the waters, and in the underworld was Sheol, the abode of the dead. The opening of Genesis 1 continues: "And the earth was formless and void..." The phrase "formless and void" is a translation of the Hebrew tohu wa-bohu, (Hebrew: תֹהוּ וָבֹהוּ‎), chaos, the condition that bara, ordering, remedies. Tohu by itself means "emptiness, futility"; it is used to describe the desert wilderness; bohu has no known meaning and was apparently coined to rhyme with and reinforce tohu. The phrase appears also in Jeremiah 4:23 where the prophet warns Israel that rebellion against God will lead to the return of darkness and chaos, "as if the earth had been 'uncreated'". The opening of Genesis 1 concludes with a statement that "darkness was on the face of the deep" (Hebrew: תְהוֹם‎ tehôm), [the] "darkness" and the "deep" being two of the three elements of the chaos represented in tohu wa-bohu (the third is the "formless earth"). In the Enuma Elish, the "deep" is personified as the goddess Tiamat, the enemy of Marduk; here it is the formless body of primeval water surrounding the habitable world, later to be released during the Deluge, when "all the fountains of the great deep burst forth" from the waters beneath the earth and from the "windows" of the sky. The Rûach of God moves over the face of the deep before creation begins. Rûach (רוּחַ) has the meanings "wind, spirit, breath", and elohim can mean "great" as well as "god": the ruach elohim may therefore mean the "wind/breath of God" (the storm-wind is God's breath in Psalms 18:16 and elsewhere, and the wind of God returns in the Flood story as the means by which God restores the Earth), or God's "spirit", a concept which is somewhat vague in the Hebrew Bible, or it may simply signify a great storm-wind. God's first act was the creation of undifferentiated light; dark and light were then separated into night and day, their order (evening before morning) signifying that this was the liturgical day; and then the Sun, Moon and stars were created to mark the proper times for the festivals of the week and year. Only when this is done does God create man and woman and the means to sustain them (plants and animals). At the end of the sixth day, when creation is complete, the world is a cosmic temple in which the role of humanity is the worship of God. This parallels Mesopotamian myth (the Enuma Elish) and also echoes chapter 38 of the Book of Job, where God recalls how the stars, the "sons of God", sang when the corner-stone of creation was laid. Day 1 begins with the creation of light (and, by implication, time). God creates by spoken command and names the elements of the world as he creates them. In the ancient Near East the act of naming was bound up with the act of creating: thus in Egyptian literature the creator god pronounced the names of everything, and the Enûma Elish begins at the point where nothing has yet been named. God's creation by speech also suggests that he is being compared to a king, who has merely to speak for things to happen. Rāqîa‘, the word translated as firmament, is from rāqa‘, the verb used for the act of beating metal into thin plates. Created on the second day of creation and populated by luminaries on the fourth, it is a solid dome which separates the Earth below from the heavens and their waters above, as in Egyptian and Mesopotamian belief of the same time. In Genesis 1:17 the stars are set in the raqia‘; in Babylonian myth the heavens were made of various precious stones (compare Exodus 24:10 where the elders of Israel see God on the sapphire floor of heaven), with the stars engraved in their surface. On the third day, the waters withdraw, creating a ring of ocean surrounding a single circular continent. By the end of the third day God has created a foundational environment of light, heavens, seas and earth. The three levels of the cosmos are next populated in the same order in which they were created – heavens, sea, earth. God does not create or make trees and plants, but instead commands the earth to produce them. The underlying theological meaning seems to be that God has given the previously barren earth the ability to produce vegetation, and it now does so at his command. "According to (one's) kind" appears to look forward to the laws found later in the Pentateuch, which lay great stress on holiness through separation. 15 and let them be for lights in the firmament of the heaven to give light upon the earth.’ And it was so. 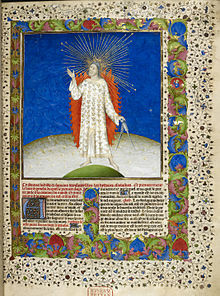 On Day Four the language of "ruling" is introduced: the heavenly bodies will "govern" day and night and mark seasons and years and days (a matter of crucial importance to the Priestly authors, as religious festivals were organised around the cycles of the Sun and Moon); later, man will be created to rule over the whole of creation as God's regent. God puts "lights" in the firmament to "rule over" the day and the night. Specifically, God creates the "greater light," the "lesser light," and the stars. According to Victor Hamilton, most scholars agree that the choice of "greater light" and "lesser light", rather than the more explicit "Sun" and "Moon", is anti-mythological rhetoric intended to contradict widespread contemporary beliefs that the Sun and the Moon were deities themselves. In the Egyptian and Mesopotamian mythologies, the creator-god has to do battle with the sea-monsters before he can make heaven and earth; in Genesis 1:21, the word tannin, sometimes translated as "sea monsters" or "great creatures", parallels the named chaos-monsters Rahab and Leviathan from Psalm 74:13, and Isaiah 27:1, and Isaiah 51:9, but there is no hint (in Genesis) of combat, and the tannin are simply creatures created by God. 24 And God said: ‘Let the earth bring forth the living creature after its kind, cattle, and creeping thing, and beast of the earth after its kind.’ And it was so. 30 and to every beast of the earth, and to every fowl of the air, and to every thing that creepeth upon the earth, wherein there is a living soul, [I have given] every green herb for food.’ And it was so. When in Genesis 1:26 God says "Let us make man", the Hebrew word used is adam; in this form it is a generic noun, "mankind", and does not imply that this creation is male. After this first mention the word always appears as ha-adam, "the man", but as Genesis 1:27 shows ("So God created man in his [own] image, in the image of God created he him; male and female created he them. "), the word is still not exclusively male. Being God's representative or viceroy on earth. 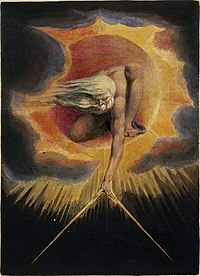 The fact that God says "Let us make man..." has given rise to several theories, of which the two most important are that "us" is majestic plural, or that it reflects a setting in a divine council with God enthroned as king and proposing the creation of mankind to the lesser divine beings. God tells the animals and humans that he has given them "the green plants for food" – creation is to be vegetarian. Only later, after the Flood, is man given permission to eat flesh. The Priestly author of Genesis appears to look back to an ideal past in which mankind lived at peace both with itself and with the animal kingdom, and which could be re-achieved through a proper sacrificial life in harmony with God. Upon completion, God sees that "every thing that He had made ... was very good" (Genesis 1:31). This implies that the materials that existed before the Creation ("tohu wa-bohu," "darkness," "tehom") were not "very good." Israel Knohl hypothesized that the Priestly source set up this dichotomy to mitigate the problem of evil. 1 And the heaven and the earth were finished, and all the host of them. 3 And God blessed the seventh day, and hallowed it; because that in it He rested from all His work which God in creating had made. Creation is followed by rest. In ancient Near Eastern literature the divine rest is achieved in a temple as a result of having brought order to chaos. Rest is both disengagement, as the work of creation is finished, but also engagement, as the deity is now present in his temple to maintain a secure and ordered cosmos. Compare with Exodus 20:8–20:11: "Remember the sabbath day, to keep it holy. Six days shalt thou labour, and do all thy work; but the seventh day is a sabbath unto the LORD thy God, in it thou shalt not do any manner of work, thou, nor thy son, nor thy daughter, nor thy man-servant, nor thy maid-servant, nor thy cattle, nor thy stranger that is within thy gates; for in six days the LORD made heaven and earth, the sea, and all that in them is, and rested on the seventh day; wherefore the LORD blessed the sabbath day, and hallowed it." Genesis 2–3, the Garden of Eden story, was probably authored around 500 BCE as "a discourse on ideals in life, the danger in human glory, and the fundamentally ambiguous nature of humanity – especially human mental faculties". The Garden in which the action takes place lies on the mythological border between the human and the divine worlds, probably on the far side of the Cosmic ocean near the rim of the world; following a conventional ancient Near Eastern concept, the Eden river first forms that ocean and then divides into four rivers which run from the four corners of the earth towards its centre. It opens "in the day that the LORD God made the earth and the heavens", a set introduction similar to those found in Babylonian myths. Before the man is created the earth is a barren waste watered by an ed; Genesis 2:6 the King James Version translated this as "mist", following Jewish practice, but since the mid-20th century Hebraists have generally accepted that the real meaning is "spring of underground water". In Genesis 1 the characteristic word for God's activity is bara, "created"; in Genesis 2 the word used when he creates the man is yatsar, meaning "fashioned", a word used in contexts such as a potter fashioning a pot from clay. God breathes his own breath into the clay and it becomes nephesh, a word meaning "life", "vitality", "the living personality"; man shares nephesh with all creatures, but the text describes this life-giving act by God only in relation to man. Eden, where God puts his Garden of Eden, comes from a root meaning "fertility": the first man is to work in God's miraculously fertile garden. The "tree of life" is a motif from Mesopotamian myth: in the Epic of Gilgamesh the hero is given a plant whose name is "man becomes young in old age", but a serpent steals the plant from him. There has been much scholarly discussion about the type of knowledge given by the second tree. Suggestions include: human qualities, sexual consciousness, ethical knowledge, or universal knowledge; with the last being the most widely accepted. In Eden, mankind has a choice between wisdom and life, and chooses the first, although God intended them for the second. The mythic Eden and its rivers may represent the real Jerusalem, the Temple and the Promised Land. Eden may represent the divine garden on Zion, the mountain of God, which was also Jerusalem; while the real Gihon was a spring outside the city (mirroring the spring which waters Eden); and the imagery of the Garden, with its serpent and cherubs, has been seen as a reflection of the real images of the Solomonic Temple with its copper serpent (the nehushtan) and guardian cherubs. Genesis 2 is the only place in the Bible where Eden appears as a geographic location: elsewhere (notably in the Book of Ezekiel) it is a mythological place located on the holy Mountain of God, with echoes of a Mesopotamian myth of the king as a primordial man placed in a divine garden to guard the tree of life. "Good and evil" is a merism, in this case meaning simply "everything", but it may also have a moral connotation. When God forbids the man to eat from the tree of knowledge he says that if he does so he is "doomed to die": the Hebrew behind this is in the form used in the Bible for issuing death sentences. The first woman is created to be ezer kenegdo – a term notably difficult to translate – to the man. Kenegdo means "alongside, opposite, a counterpart to him", and ezer means active intervention on behalf of the other person. God's naming of the elements of the cosmos in Genesis 1 illustrated his authority over creation; now the man's naming of the animals (and of Woman) illustrates Adam's authority within creation. 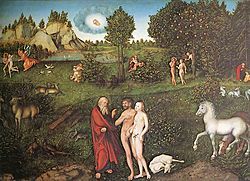 The meaning to be derived from the Genesis creation narrative will depend on the reader's understanding of its genre, the literary "type" to which it belongs: "it makes an enormous difference whether the first chapters of Genesis are read as scientific cosmology, creation myth, or historical saga". Different interpretations of the genre of the text, meaning the intention of the author/s and the culture within which they wrote, exist. Reformed evangelical scholar Bruce Waltke cautions against one such interpretation, the "woodenly literal" approach which leads to "creation science" and such "implausible interpretations" as the "gap theory", the presumption of a "young earth", and the denial of evolution. Another scholar, Conrad Hyers, sums up the same thought in these words: "A literalist interpretation of the Genesis accounts is inappropriate, misleading, and unworkable [because] it presupposes and insists upon a kind of literature and intention that is not there." Whatever else it may be, Genesis 1 is "story", since it features character and characterisation, a narrator, and dramatic tension expressed through a series of incidents arranged in time. The Priestly author of Genesis 1 had to confront two major difficulties. First, there is the fact that since only God exists at this point, no-one was available to be the narrator; the storyteller solved this by introducing an unobtrusive "third person narrator". Second, there was the problem of conflict: conflict is necessary to arouse the reader's interest in the story, yet with nothing else existing, neither a chaos-monster nor another god, there cannot be any conflict. This was solved by creating a very minimal tension: God is opposed by nothingness itself, the blank of the world "without form and void." Telling the story in this way was a deliberate choice: there are a number of creation stories in the Bible, but they tend to be told in the first person, by Wisdom, the instrument by which God created the world; the choice of omniscient third-person narrator in the Genesis narrative allows the storyteller to create the impression that everything is being told and nothing held back. It can also be regarded as ancient history, "part of a broader spectrum of originally anonymous, history-like ancient Near Eastern narratives." It is frequently called myth in scholarly writings, but there is no agreement on how "myth" is to be defined, and so while Brevard Childs famously suggested that the author of Genesis 1–11 "demythologised" his narrative, meaning that he removed from his sources (the Babylonian myths) those elements which did not fit with his own faith, others can say it is entirely mythical. Genesis 1–2 can be seen as ancient science: in the words of E.A. Speiser, "on the subject of creation biblical tradition aligned itself with the traditional tenets of Babylonian science." The opening words of Genesis 1, "In the beginning God created the heavens and the earth", sum up the author(s) belief that Yahweh, the god of Israel, was solely responsible for creation and had no rivals. Later Jewish thinkers, adopting ideas from Greek philosophy, concluded that God's Wisdom, Word and Spirit penetrated all things and gave them unity. Christianity in turn adopted these ideas and identified Jesus with the creative word: "In the beginning was the Word, and the Word was with God, and the Word was God" (John 1:1). When the Jews came into contact with Greek thought it led to a major reinterpretation of the underlying cosmology of the Genesis narrative. The biblical authors conceived the cosmos as a flat disc-shaped Earth in the centre, an underworld for the dead below, and heaven above. Below the Earth were the "waters of chaos", the cosmic sea, home to mythic monsters defeated and slain by God; in Exodus 20:4, God warns against making an image "of anything that is in the waters under the earth". There were also waters above the Earth, and so the raqia (firmament), a solid bowl, was necessary to keep them from flooding the world. During the Hellenistic period this was largely replaced by a more "scientific" model as imagined by Greek philosophers, according to which the Earth was a sphere at the centre of concentric shells of celestial spheres containing the Sun, Moon, stars and planets. The idea that God created the world out of nothing (creatio ex nihilo) is central today to Islam, Christianity, and Judaism – indeed, the medieval Jewish philosopher Maimonides felt it was the only concept that the three religions shared – yet it is not found directly in Genesis, nor in the entire Hebrew Bible. The Priestly authors of Genesis 1 were concerned not with the origins of matter (the material which God formed into the habitable cosmos), but with assigning roles so that the Cosmos should function. This was still the situation in the early 2nd century AD, although early Christian scholars were beginning to see a tension between the idea of world-formation and the omnipotence of God; by the beginning of the 3rd century this tension was resolved, world-formation was overcome, and creation ex nihilo had become a fundamental tenet of Christian theology. ^ Leeming & Leeming 2009, p. 113. ^ a b c Sarna 1997, p. 50. ^ a b Davies 2007, p. 37. ^ Bandstra 2008, p. 37. ^ Wenham 2003b, p. 37. ^ a b Andersen 1987, p. 142. ^ a b Waltke 1991, pp. 6–9. ^ Speiser 1964, p. xxi. ^ Ska 2006, pp. 169, 217–18. ^ a b Alter 1981, p. 141. ^ Ruiten 2000, pp. 9–10. ^ Levenson 2004, p. 9 "One aspect of narrative in Genesis that requires special attention is its high tolerance for different versions of the same event, a well-known feature of ancient Near Eastern literature, from earliest times through rabbinic midrash. ... This could not have happened if the existence of variation were seen as a serious defect or if rigid consistency were deemed essential to effective storytelling." ^ a b Carr 1996, pp. 62–64. ^ a b Carr 1996, p. 64. ^ Cross 1973, pp. 301ff. ^ Thomas 2011, pp. 27–28. ^ a b Lambert 1965. ^ a b Levenson 2004, p. 9. ^ Kutsko 2000, p. 62, quoting J. Maxwell Miller. ^ McDermott 2002, pp. 25–27. ^ Smith 2001, Chapter 6. ^ Van Seters 1992, pp. 122–24. ^ Charles Russell Coulter; Patricia Turner (eds.). Encyclopedia of Ancient Deities. ^ Meagher, Robert Emmet (1995). The meaning of Helen : in search of an ancient icon. United States: BOLCHAZY-CARDUCCI PUBS (IL). ISBN 0865165106. ^ Fishbane 2003, pp. 34–35. ^ Hutton 2007, p. 274. ^ Levenson 2004, p. 13. ^ a b c Walton 2006, p. 183. ^ Hyers 1984, p. 74. ^ Wenham 1987, p. 6. ^ Bandstra 2008, pp. 38–39. ^ Spence 2010, p. 72. ^ Knight 1990, pp. 175–76. ^ Alter 2004, p. 17. ^ Thompson 1980, p. 230. ^ Wenham 2003a, p. 29. ^ Blenkinsopp 2011, pp. 33–34. ^ Blenkinsopp 2011, pp. 21–22. ^ Walton 2003, p. 158. ^ Bandstra 2008, p. 39. ^ Hamilton 1990, p. 122. ^ Seeley 1991, p. 227. ^ Walton 2003, pp. 158–59. ^ Bandstra 2008, p. 41. ^ Kissling 2004, p. 106. ^ Bandstra 2008, pp. 41–42. ^ Hamilton 1990, p. 127. ^ Walton 2003, p. 160. ^ Alter 2004, pp. 18–19, 21. ^ Kvam et al. 1999, p. 24. ^ Davidson 1973, p. 24. ^ Levenson 2004, p. 14. ^ Rogerson 1991, pp. 19ff. ^ Knohl 2003, p. 13. ^ Walton 2006, pp. 157–58. ^ a b Stordalen 2000, pp. 473–74. ^ Van Seters 1998, p. 22. ^ Andersen 1987, pp. 137–40. ^ Alter 2004, pp. 20, 22. ^ Davidson 1973, p. 31. ^ Levenson 2004, p. 15. ^ Davidson 1973, p. 29. ^ Levenson 2004, p. 9 "The story of Adam and Eve's sin in the garden of Eden (2.25–3.24) displays similarities with Gilgamesh, an epic poem that tells how its hero lost the opportunity for immortality and came to terms with his humanity. ... the biblical narrator has adapted the Mesopotamian forerunner to Israelite theology." ^ Kooij 2010, p. 17. ^ Propp 1990, p. 193. ^ Stordalen 2000, pp. 307–10. ^ Alter 2004, p. 22. ^ Turner 2009, p. 20. ^ Hastings 2003, p. 607. ^ Jacobs 2007, p. 37. ^ Hugenberger 1988, p. 184. ^ Schnell, Rüdiger (1998-01-01). Geschlechterbeziehungen und Textfunktionen: Studien zu Eheschriften der Frühen Neuzeit (in German). Walter de Gruyter. pp. 167 ff. ISBN 9783110940398. ^ Hyers 1984, p. 28. ^ Cotter 2003, pp. 5–9. ^ a b Cotter 2003, p. 7. ^ Cotter 2003, p. 8. ^ Carr 1996, p. 21. ^ Hamilton 1990, pp. 57–58. ^ Seidman 2010, p. 166. ^ a b Wright 2002, p. 53. ^ a b Aune 2003, p. 119. Andersen, Francis I. (1987). "On Reading Genesis 1–3". In O'Connor, Michael Patrick; Freedman, David Noel. Backgrounds for the Bible. Eisenbrauns. ISBN 9780931464300. Brueggemann, Walter (1982). "Genesis 1:1–2.4". Interpretation of Genesis. Westminster John Knox Press. p. 382. ISBN 978-0-8042-3101-5. Cross, Frank Moore (1973). "The Priestly Work". Canaanite Myth and Hebrew Epic: Essays in the History of the Religion of Israel. Harvard University Press. p. 394. ISBN 0-674-09176-0. Davies, G.I. (2007). "Introduction to the Pentateuch". In Barton, John; Muddiman, John. Oxford Bible Commentary. Oxford University Press. ISBN 9780199277186. Dolansky, Shawna (2016). "The Multiple Truths of Myths". Biblical Archaeology Review. 42 (1): 18, 60. Ginzberg, Louis (1909). The Legends of the Jews (PDF). Jewish Publication Society. p. 695. Heidel, Alexander (1963). Babylonian Genesis (2nd ed.). Chicago University Press. ISBN 0-226-32399-4. Heidel, Alexander (1963). The Gilgamesh Epic and Old Testament Parallels (2nd Revised ed.). Chicago University Press. ISBN 0-226-32398-6. Hugenberger, G.P. (1988). "Rib". In Bromiley, Geoffrey W. The International Standard Bible Encyclopedia, Volume 4. Eerdmans. ISBN 9780802837844. Hutton, Jeremy (2007). Isaiah 51:9–11 and the Rhetorical Appropriation and Subversion of Hostile Theologies. Journal of Biblical Literature. 126. Society of Biblical Literature. JSTOR 27638435. Kaplan, Aryeh (2002). "Hashem/Elokim: Mixing Mercy with Justice". The Aryeh Kaplan Reader: The Gift He Left Behind. Mesorah Publication, Ltd. p. 224. ISBN 0-89906-173-7. Retrieved 29 December 2010. Knight, Douglas A (1990). "Cosmology". In Watson E. Mills (General Editor). Mercer Dictionary of the Bible. Mercer University Press. ISBN 9780865543737. Kooij, Arie van der (2010). "The Story of Paradise in the Light of Mesopotamian Culture and Literature". In Dell, Katherine J; Davies, Graham; Koh, Yee Von. Genesis, Isaiah, and Psalms. Brill. ISBN 9004182314. Kramer, Samuel Noah (1956). History Begins at Sumer: Thirty-Nine Firsts in Recorded History. Lambert, W. G. (1965). "A New Look at the Babylonian Background of Genesis". The Journal of Theological Studies. 16 (2). pp. 287–300. JSTOR 23959032. Leeming, David A. (2004). "Biblical creation". The Oxford Companion to World Mythology. Oxford University Press. Retrieved 2010-05-05. Leeming, David A.; Leeming, Margaret (2004). A Dictionary of Creation Myths. Oxford University Press. ISBN 9780195102758. Louth, Andrew (2001). "Introduction". In Andrew Louth. Genesis 1–11. InterVarsity Press. ISBN 9780830814718. Parrish, V. Steven (1990). "Creation". In Watson E. Mills (General Editor). Mercer Dictionary of the Bible. Mercer University Press. ISBN 9780865543737. Propp, W.H. (1990). "Eden Sketches". In Propp, W.H. ; Halpern, Baruch; Freedman, D.N. The Hebrew Bible and its Interpreters. Eisenbrauns. ISBN 9780931464522. Sarna, Nahum M. (1997). "The Mists of Time: Genesis I–II". In Feyerick, Ada. Genesis: World of Myths and Patriarchs. New York: NYU Press. p. 560. ISBN 0-8147-2668-2. Ryken, Leland; Wilhoit, Jim; Longman, Tremper; Duriez, Colin; Penney, Douglas; Reid, Daniel G., eds. (1998). "Cosmology". Dictionary of Biblical Imagery. InterVarsity Press. ISBN 9780830867332. Sawyer, John F.A. (1992). "The Image of God, the Wisdom of Serpents, and the Knowledge of Good and Evil". In Paul Morris, Deborah Sawyer. A Walk in the Garden: Biblical, Iconographical and Literary Images of Eden. Sheffield Academic Press Press. ISBN 9780567024473. Seidman, Naomi (2010). "Translation". In Ronald Hendel. Reading Genesis: Ten Methods. Cambridge University Press. ISBN 9780521518611. Seeley, Paul H. (1991). "The Firmament and the Water Above: The Meaning of Raqia in Genesis 1:6–8" (PDF). Westminster Theological Journal. Westminster Theological Seminary. 53: 227–40. Smith, Mark S. (Oct 2002). The Early History of God: Yahweh and the Other Deities in Ancient Israel (2nd ed.). William B Eerdmans Publishing Co. ISBN 0-8028-3972-X. Smith, Mark S. (Nov 2001). The Origins of Biblical Monotheism: Israel's Polytheistic Background and the Ugaritic Texts (New ed.). Oxford University Press USA. ISBN 0-19-516768-6. Stagg, Evelyn and Frank (1978). "Genesis and Science". Woman in the World of Jesus. Philadelphia, Pennsylvania: Westminster Press. p. 135. ISBN 0-664-24195-6. Thompson, J. A. (1980). Jeremiah. New International Commentary on the Old Testament (2nd ed.). Wm. B. Eerdmans Publishing Company. p. 831. ISBN 0-8028-2530-3. Van Seters, John (1998). "The Pentateuch". In McKenzie, Steven L.; Graham, M. Patrick. The Hebrew Bible Today: An Introduction to Critical Issues. Westminster John Knox Press. ISBN 9780664256524. Waltke, Bruce (1991). "The Literary Genre of Genesis, Chapter One" (PDF). Crux. Westminster Theological Seminary. 27:4. Archived from the original (PDF) on 29 April 2014. Walton, John H. (2003). "Creation". In T. Desmond Alexander, David Weston Baker. Dictionary of the Old Testament: Pentateuch. InterVarsity Press. ISBN 9780830817818. Wenham, Gordon (2003a). Exploring the Old Testament: A Guide to the Pentateuch. Exploring the Bible Series. 1. IVP Academic. p. 223. Wenham, Gordon (2003b). "Genesis". In Dunn, James Douglas Grant; Rogerson, J. John William. Eerdmans Commentary on the Bible. Eerdmans. ISBN 9780802837110. Wood, Ralpth C (1990). "Genre, Concept of". In Watson E. Mills (General Editor). Mercer Dictionary of the Bible. Mercer University Press. ISBN 9780865543737. Wylen, Stephen M. (2005). "Chapter 6 Midrash". The Seventy Faces of Torah: The Jewish way of Reading the Sacred Scriptures. Paulist Press. p. 256. ISBN 0-8091-4179-5. Wikimedia Commons has media related to Creation according to Genesis.